The firm foam offers perfect comfort for automotive, boating and industrial applications. Southeast Michigan’s largest foam distributor and manufacturer is offering a new grade of firm, “Super Lux” Foam. Available now, this new line of foam offers one of the firmest grades of foam currently available on the market. As a firmer foam cushion filling, Super Lux is primarily used in the automotive and boating industries. It comprises the backs and bottoms of seat cushions, but it’s also found in high-use applications and public seating too. Firmer foam makes for excellent seat cushions in restaurant booths and bar stools. Mechanics use it for knee or seat cushion padding for specialty stools and car rollers, to make work comfortable and manageable. DIY users will want to make sure they follow the golden rule of contracting: measure twice and cut once. Super Lux can withstand the harshness of wet conditions, but those utilizing it for the purposes of boating cushions should place a waterproof or plastic cover on each of the new cushions, and dry them seasonally for the best performance. This also reduces the chances of unwanted odors. Super Lux is now available from The Foam Factory, in standard sizes: 82"x76", 82"x36", and 82"x24", with thicknesses ranging from: 1/2", 1", 1-1/2", 2", 2-1/2", 3". The Foam Factory began with a family loan in 1980, and has since grown to become the largest family-owned and financed business for the past 30 years. 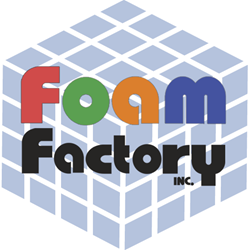 Located in 310,000 square foot facility in Southeast Michigan, The Foam Factory specializes in acoustics, bedding, packing materials, foam sponges and more. The company combines manufacturing and a retail setting to offer affordable prices, custom cuts and the foam to accomplish whatever project one has in mind. Using computer-controlled technology, The Foam Factory can offer precise cuts based on custom orders. The Foam Factory offers free shipping on all purchases over $75, and a price matching guarantee.